Prime Minister and Interior Minister H E Sheikh Abdullah bin Nasser bin Khalifa Al Thani and Prime Minister of the Federal Republic of Somalia, Hassan Ali Khairi, witnessed the signing of a number of agreements and memoranda of understanding (MoUs) between the governments of the two countries at the Amiri Diwan yesterday. They witnessed the signing of an agreement of avoidance of double taxation and prevention of fiscal evasion, an agreement on encouraging and protecting mutual investments, agreement on maritime transport and an agreement on economic, trade and technical cooperation. The two sides also signed an MoU on cooperation in the field of ports, MoU on cooperation between the Diplomatic Institute in the Qatar’s Foreign Ministry and the Diplomatic Institute in the Somalia’s Foreign Ministry, MoU on the establishment of a joint supreme committee and an MoU on political cooperation and consultation between the Qatar’s Ministry of Foreign Affairs and Somalia’s Ministry of Foreign Affairs and International Cooperation. 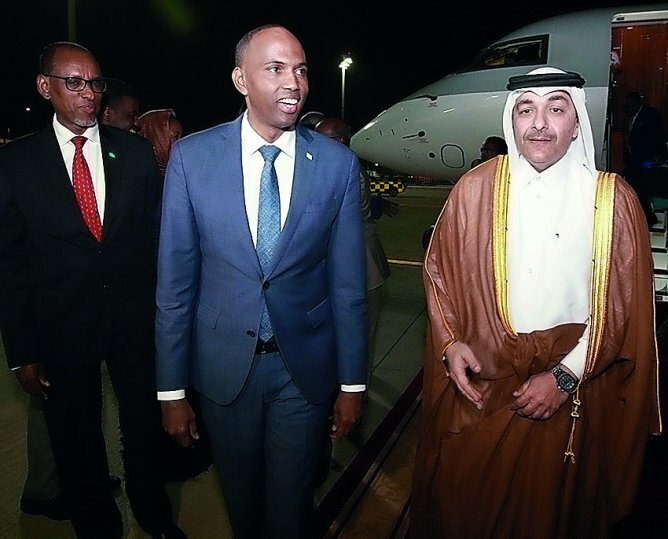 The ceremonies were attended by a number of Their Excellences Ministers, and on the Somali side by members of the official delegation accompanying the Prime Minister.